Released in 1982 for me Friday the 13th is in a sense the perfect slasher film; it’s has some decent suspense and scares with a creepy villain and just as important the movie is a lot of fun. The film has the right balance of dialogue, stalk scenes and death scenes to keep it moving at a fun pace and that’s why I said in a sense its the perfect slasher film even if not one of the best out there. Of all the Friday the 13th movies besides the original this one along with Jason Lives are my favorites. You know those movies you like a lot more than you should? 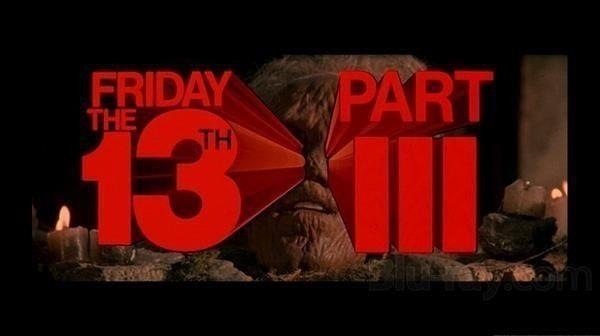 Well Friday the 13th Part 3 is that movie for me. Sure this is your typical slasher flick with the typical slasher movie characters, but there is just something about this movie I love. 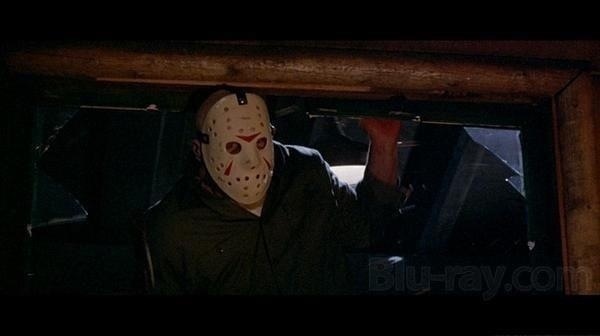 The Friday the 13th series often gets mixed reviews, but I really think these movies have a little more to offer than given credit for; the first 4 movies were legit attempts at creating suspense and scares and granted the original exploited what made Halloween so popular and so great, but I still think Friday the 13th is a classic and while the sequels may not be classic status worthy, I do again think the first 4 have more to offer than given credit for. I first saw this back in the 80s as a child and I’ve seen it again through the years as a teenager and adult so maybe since I know the movie so well I see more than what’s there, but I really do think this is an excellent slasher flick and is truly a blast to watch; what makes this movie sort of legendary is this is the first part that Jason wears the hockey mask, which has become such an Iconic image in not just the horror genre, but in film in general. Screenwriters Martin Kitrosser and Carol Watson actually try and elevate the screenplay to be more than the typical stalk and slash movie as there is some attempts at creating some drama, which also might add a little more depth for the characters. They seemed to have a few ideas, but it just wasn’t quite there yet. In some ways I think this might be the best written in regards to trying to do a little more with the characters, but this one also in other ways has the least amount of plot. But Kitrosser & Watson seem to wanna do a little more with the characters, but in the end none of these ideas factor into the final product. The characters are your standard slasher characters they may not have the most depth and might be disposable, but they do have their own identities and quite honestly I found the characters here one of the most likable set of characters of the series. 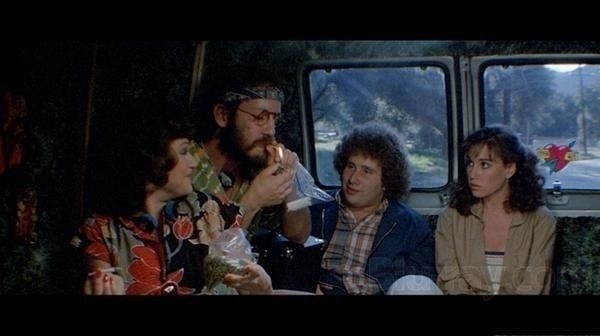 You have the basic characters the best friend, the jock and the stoners and even in 1982 this was starting to get clichéd and sometimes that can really sink a movie, but I think it sort of helps Friday the 13th Part 3. Kitrosser and Watson have some good ideas with the characters and Shelly (Zerner) is one of my favorite characters and I think a lot of people can relate to the character; he doesn’t quite fit in with the rest of the characters and I think a lot of people felt the way Shelly did in the movie and for that he’s one of my favorite characters in the series. As I brought up before there were some interesting ideas presented but weren’t explored enough. There was a back-story with the character Chris (Kimmell) and how she encountered Jason (Brooker) a couple of years back. The concept seems like it’s going to lead to something, but it never comes about. I did hear that an original idea was a sexual assault and if you pay close attention to the dialogue early it does seem like that was a direction the movie was heading. But come a certain point the idea is dropped, which isn’t a bad thing and it just says how Chris was once attacked by Jason. Despite not really going anywhere it actually works in the favor of the movie and helped give Chris more depth. There was also a back-story with Rick (Kratka) and Chris, which normally in these movies feels very out of place, but it works rather well and adds some more depth for Chris and even a little bit for Rick; that subplot could have been a disaster, but works well. That is why I go back to the script having some decent ideas. Martin Kitrosser and Carol Watson had some good ideas with the Chris character and overall they had a good idea with the movie, but never fully developed any of it. A lot of reviews cite this as one of the weaker ones in terms of characters, but like I said I liked the characters, which helps my enjoyment of the film. The script though is simple and while it may to be great it is fun. Director Steve Miner crafts a fun film with some solid suspense, eerie atmosphere and looming danger; he also gets great use of his locations and does a great job at making it feel very isolated and cut off. In many ways the ranch sort of becomes a character of its own. 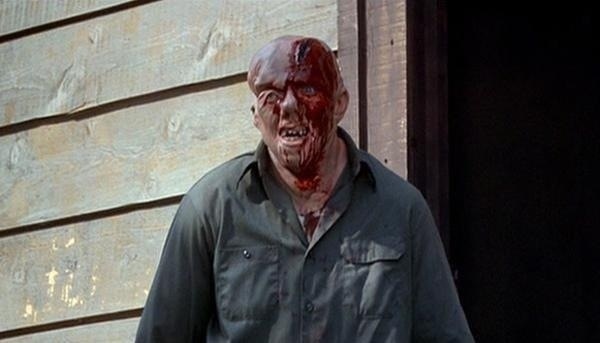 In Friday the 13th Part 2, which was Miner’s directorial debut he very much followed what Sean Cunningham did with the original and its sort of a remake in sequel form. 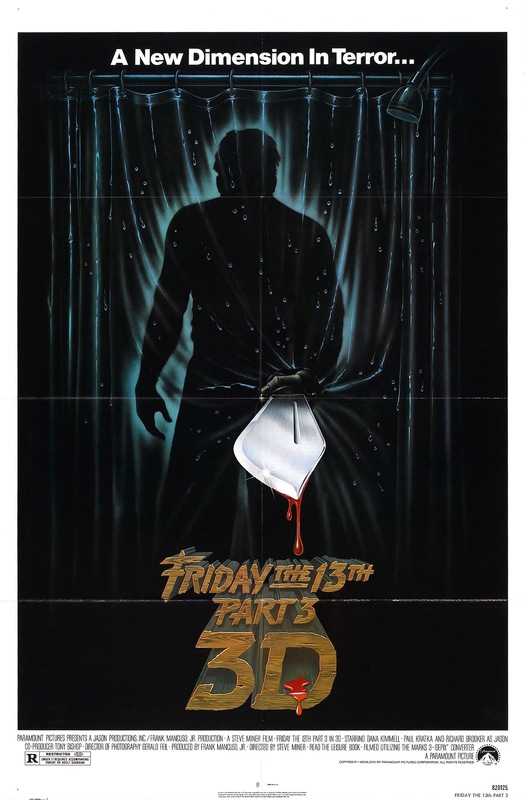 But here with Friday the 13th Part 3 he’s able to add a little more of his own style, but he also owes a lot to John Carpenter as the shots of Jason waiting and watching remind me a lot of Halloween. But rather than be a carbon copy again Miner is able to inject his own style. Through his career Steve Miner has pretty much been a director for hire as be more often than not makes films that are in style and follows the format other directors did. That isn’t a knock since I do like some if his films, but I wish he would have done more work like this where he doesn’t simply rehash other filmmakers. The pace of the film is quite strong as there really isn’t a slow moment; Jason’s always out there watching, which helps create some tension and than he strikes. When it comes to horror movies the final act is so very important. A great horror movie could be ruined by it and an average horror movie could suddenly become much better cause of it. 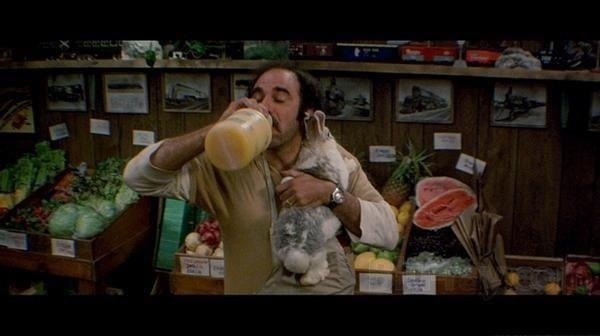 In my opinion the final act of Friday the 13th Part 3 just might be the most solid of the whole series. The overall atmosphere for the final chase between Chris and Jason can be quite creepy. We all know horror flicks work at their best when the characters are isolated in a certain area and when you only have the killer and the intended victim in the isolated area it’s even better. You get the sense that Chris is trapped here and the only thing she can do is try to survive. It also helps that while strong Chris was also vulnerable and Jason in my opinion was at his scariest in part 3 in my opinion. 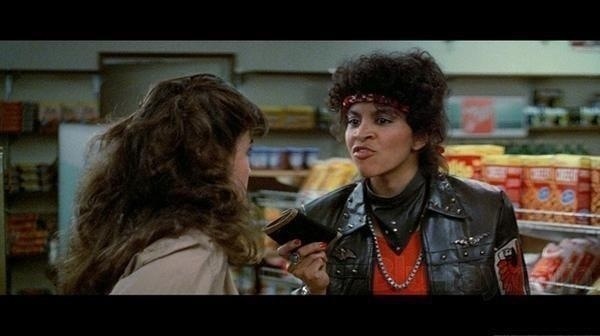 For my money Friday the 13th Part 3 had the best final act of the series. The acting wasn’t bad either; what people seem to forget is this is a slasher movie not an Oscar worthy film. 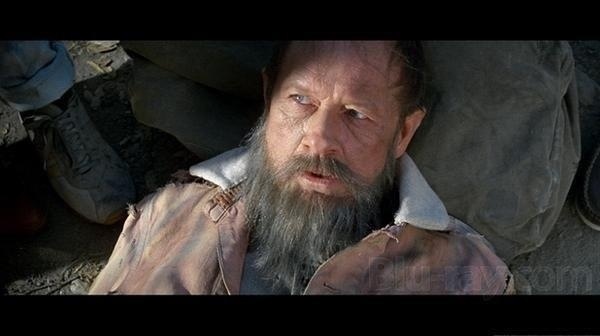 The actors all do a fine job with their characters and come across as real people and that for me made me like the movie even more since when they died I felt bad for them. Dana Kimmell who played Chris was by far my favorite character of the series and quite honestly one of my all time favorite final girls. Richard Brooker made an excellent Jason; he was big and strong, but still had some human qualities to him he was also in my opinion the most imposing and also gave Jason some personality. Richard Brooker is by far my favorite Jason. In my personal opinion Richard Brooker was by far the scariest Jason. I loved his movements and even at times his fun in killing and his frustration. Like when he’s looking around the barn for Chris and when he can’t find her he starts throwing things out of his way. 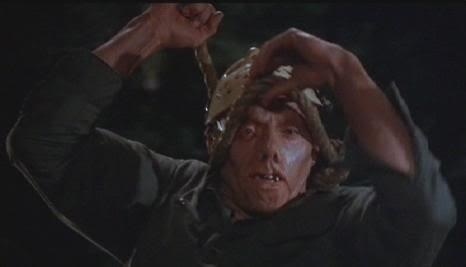 Jason had the most personality in this part and while other actors did well, Richard Brooker for me was the scariest and most imposing of all the actors to play Jason. 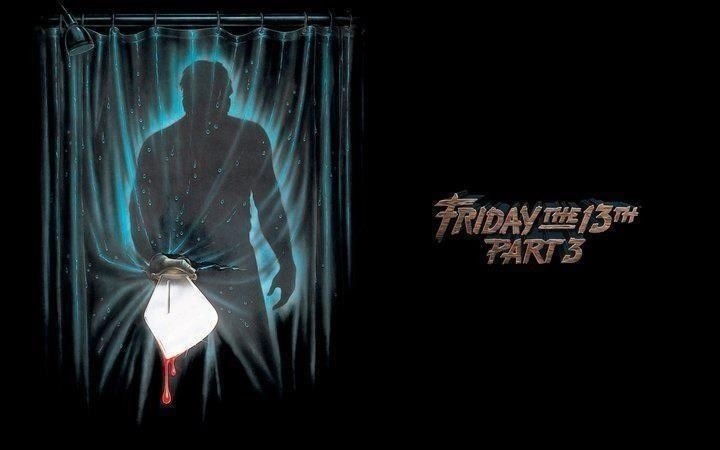 Friday the 13th Part 3 is far from perfect; make no mistake it does have its flaws. But it’s also a well-made slasher flick with a creepy villain and likable characters. Something some of the later installments didn’t have.